Nigel Ernest James Mansell, CBE (/ˈmænsəl/; born 8 August 1953) is a British former racing driver who won both the Formula One World Championship (1992) and the CART Indy Car World Series (1993). Mansell was the reigning F1 champion when he moved over to CART, becoming the first person to win the CART title in his debut season, and making him the only person to hold both the World Drivers' Championship and the American open-wheel National Championship simultaneously. His career in Formula One spanned 15 seasons, with his final two full seasons of top-level racing being spent in the CART series. Mansell is the second most successful British Formula One driver of all time in terms of race wins with 31 victories, and is seventh overall on the Formula One race winners list behind Michael Schumacher, Lewis Hamilton, Sebastian Vettel, Alain Prost, Ayrton Senna and Fernando Alonso. He held the record for the most number of poles set in a single season, which was broken in 2011 by Sebastian Vettel. He was rated in the top 10 Formula One drivers of all time by longtime Formula One commentator Murray Walker. In 2008, ESPN.com ranked him 24th on their "Top 25 Drivers of All Time" list. He was also ranked No. 9 of the 50 greatest F1 drivers of all time by the Times Online on a list that also included such drivers as Prost, Senna, Jackie Stewart and Jim Clark. Nigel Ernest James Mansell was born on 8 August 1953 in Upton-upon-Severn, Worcestershire, the son of Eric, an engineer, and Joyce Mansell. Mansell had a fairly slow start to his racing career, using his own money to help work his way up the ranks. After considerable success in kart racing, he moved to the Formula Ford series to the disapproval of his father. In 1976, Mansell won six of the nine races he took part in, including his debut event at Mallory Park. He entered 42 races the following year and won 33 to become the 1977 British Formula Ford champion, despite suffering a broken neck in a qualifying session at Brands Hatch. Doctors told him he had been perilously close to quadriplegia, that he would be confined for six months and would never drive again. Mansell discharged himself from the hospital and returned to racing. Three weeks before the accident he had resigned from his job as an aerospace engineer, having previously sold most of his personal belongings to finance his foray into Formula Ford. Later that year he was given the chance to race a Lola T570 Formula 3 car at Silverstone. He finished fourth and decided that he was ready to move into the higher formula. Mansell raced in Formula Three in 1978–1980. Mansell's first season in Formula Three started with a pole position and a second-place finish. However, the car was not competitive, as a commercial deal with Unipart required his team to use Triumph Dolomite engines that were vastly inferior to the Toyota engines used by the leading teams. After three seventh-place finishes and a fourth in his last race, he parted from the team. The next season saw him take a paid drive with David Price Racing. Following a first win in the series at Silverstone in March, he went on to finish eighth in the championship. His racing was consistent, but a collision with Andrea de Cesaris resulted in a huge cartwheeling crash which he was lucky to survive. Again he was hospitalised, this time with broken vertebrae. His driving was noticed by Colin Chapman, owner of Lotus, and shortly after his accident, hiding the extent of his injury with painkillers, Mansell performed well enough during a tryout at the Paul Ricard circuit with Lotus, where he was pitted against a number of other drivers to determine who was going to take the second seat for the 1980 season alongside Mario Andretti, as Argentinean Carlos Reutemann was leaving to go to Williams. Driving a 79, the seat eventually went to Italian driver Elio de Angelis, but Mansell was selected to become a test driver for the Norfolk-based Formula One team. Mansell's skill as a test driver, including setting the fastest lap around Silverstone in a Lotus car at the time, impressed Chapman enough to give him a trio of starts in F1 in 1980, driving a development version of the Lotus 81 used by the team, the Lotus 81B. In his Formula One debut at the 1980 Austrian Grand Prix, a fuel leak in the cockpit that developed shortly before the start of the race left him with painful first and second degree burns on his buttocks. An engine failure forced him to retire from that race and his second, however an accident at his third event at Imola meant he failed to qualify. 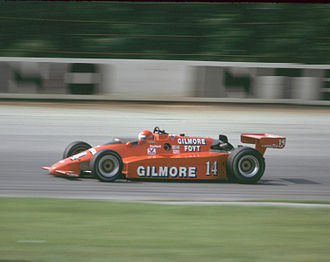 Team leader Mario Andretti wrote his car off in a start-line accident during the Canadian Grand Prix at Montreal, so Mansell had to give up his car for Andretti to compete in for his home race, the final race of the season at Watkins Glen in the United States. 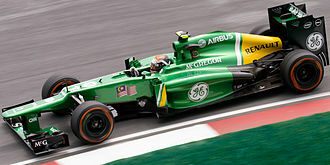 Andretti announced he was leaving to move to Alfa Romeo at the end of the season leaving Lotus with a vacant race seat. Despite Mansell being unpopular with sponsor David Thieme of Essex Petroleum, and much speculation in the press that Jean-Pierre Jarier would fill the vacancy, Chapman announced at the start of the season that the seat would be filled by Mansell. Mansell's four years as a full-time Lotus driver were a struggle, as the cars were unreliable and he was continually out-performed by teammate Elio de Angelis. Out of 59 race starts with the team, he finished just 24 of them. He managed a best finish of third place, which he achieved five times during the four years, including Lotus's fifth race of the 1981 season, and only the seventh of Mansell's Formula One career. Teammate Elio de Angelis took a surprise win at the 1982 Austrian Grand Prix, and was frequently faster than his less-experienced colleague Mansell. 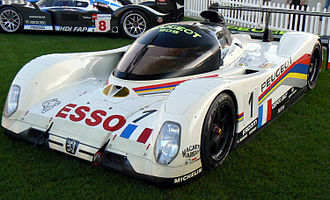 During the 1982 season, Mansell planned to race in the 24 Hours of Le Mans sportscar event in order to earn extra money. At the time Mansell was paid £50,000 a year and was offered £10,000 to take part in Le Mans. Chapman believed that by entering the Le Mans race, Mansell was exposing himself to unnecessary risk and paid him £10,000 to not take part in the race. Chapman extended Mansell's contract to the end of the 1984 season in a deal that made him a millionaire. "After carefully analysing the season just finished, it was completely clear who was the number one. It was Elio. 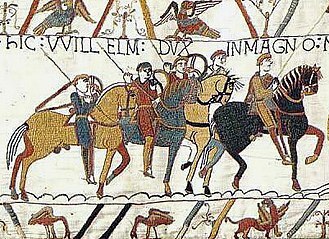 He was faster, he had out-qualified Nigel ten times to three. Elio had seven points scoring finishes to Nigel's two and in addition to Elio's win in Austria, had a tally of more than three times the number of points gained by Nigel. What is more, the margin by which Elio eclipsed his team-mate in qualifying overall was a huge 4.5 per cent. And all this in the year when, as near as can be reasonably achieved, the two drivers were given equal equipment and treatment." De Angelis was then promoted back to outright number one for the 1983 season. This was demonstrated by the fact that he had exclusive use of the quick but unreliable Renault turbo-charged 93T for the whole season, and Mansell did not get to drive a turbocharged car until the ninth round, the British Grand Prix at Silverstone, a race where he climbed from 16th to second and eventually finished fourth in a brand-new, hastily designed 94T. Due to their tumultuous relationship and a lack of decent results, Warr was not keen on honouring the last year of the contract that Mansell had signed with Chapman. However, with encouragement from Lotus's sponsors, John Player Special (who allegedly preferred a British driver), and with the only other top British driver (Derek Warwick) already confirmed to be joining the factory Renault team, it was announced Mansell would be staying with the team. In 1984, Mansell finished in the championship top 10 for the first time, and took his first career pole position but still finished behind teammate de Angelis, who finished third, in the championship. At the 1984 Monaco Grand Prix Mansell surprised many by overtaking Alain Prost in a wet race for the lead, but soon after retired from the race after losing control on the slippery painted lines on the road surface on the run up the hill on lap 15. Late in the season, Lotus announced the recruitment of Ayrton Senna for the following year, leaving Mansell with no race seat at Lotus. After receiving offers from Arrows and Williams, and first turning down Williams's offer, it was announced before the Dutch Grand Prix that he would indeed be joining Williams. Mansell was remembered by many that year when he collapsed while pushing his car to the finish line after the transmission failed on the last lap of the 1984 Dallas Grand Prix. The race was one of the hottest on record, and after two hours of driving in 104 °F (about 40 °C) conditions Mansell fainted while pushing his car over the line to salvage a sixth-place finish (and thus one championship point) in a race of which he had led half, having started from pole. In his autobiography, Mansell claimed that his final race with the Lotus team—the 1984 Portuguese Grand Prix—was heavily compromised by Warr's unwillingness to give Mansell the brake pads he desired for the race. With 18 laps of the race remaining, and with Mansell in second position, the brakes on his car failed. On Mansell's departure, Warr was quoted as saying "He'll never win a Grand Prix as long as I have a hole in my arse". In 1985 Frank Williams hired Mansell to drive alongside Keke Rosberg as part of the Williams team, Mansell later saying "We have the greatest respect for each other." Mansell was given the now famous "Red 5" number on his car, which he carried on subsequent Williams and Newman/Haas cars and which was brought to the public's attention mainly through commentator Murray Walker and his enthusiastic commentary for the BBC. Rosberg, the 1982 World Champion who was heading into his fourth season with the team, was initially against Williams signing Mansell based on the clash the pair had at Dallas the previous year (Rosberg won that race and in an interview while on the podium publicly berated Mansell's blocking tactics while leading early in the race, which earned Rosberg a round of boos from the crowd who had appreciated Mansell's courage in trying to push his Lotus to the finish in the extreme heat). Other factors were what Rosberg later said in a 1986 interview was second-hand information about Mansell which ultimately proved to be false. The drivers found they got along well and from early in the pre-season formed a good working and personal relationship. 1985 initially appeared to provide more of the same for Mansell, although he was closer to the pace than before, especially as the Honda engines became more competitive by mid-season. During practice for the 1985 French Grand Prix, Mansell unwillingly broke the record for the highest speed crash in Formula One history. At the end of the Paul Ricard Circuit's 1.8 km long Mistral Straight he went off at the fast Courbe de Signes at over 200 mph (322 km/h) in his Williams FW10. Mansell suffered concussion which kept him out of the race. Teammate Rosberg claimed the pole for the race and finished second behind the Brabham-BMW of Nelson Piquet. Mansell achieved second place at the Belgian Grand Prix at Spa-Francorchamps, and followed this with his first victory in 72 starts at the European Grand Prix at Brands Hatch in England. He achieved a second straight victory at the South African Grand Prix in Kyalami. These triumphs helped turn Mansell into a Formula One star. Going into 1986, the Williams-Honda team had a car capable of winning regularly, and Mansell had established himself as a potential World Championship contender. He also had a new teammate in twice World Champion Nelson Piquet who had joined Williams looking to be a regular winner and contender again after the Brabham-BMWs had become increasingly unreliable and uncompetitive. The Brazilian publicly described Mansell as "an uneducated blockhead" and had also criticised Mansell’s wife Roseanne’s looks, later retracting these statements following threats of legal action. Mansell won five Grand Prix in 1986 and also played a part in one of the closest finishes in Formula One history, finishing second to Ayrton Senna in the Spanish Grand Prix at Jerez by a mere 0.014 seconds (Mansell later jokingly said they should give himself and Senna 7½ points each). The 1986 season was led mostly by Mansell in championship points, and it went down to the wire in Adelaide, Australia for the Australian Grand Prix with Prost, Piquet and Mansell all still in contention for the title. The equation was simple, Prost and Piquet needed to win and have Mansell finish no higher than fourth. After aiming for a third-place finish which would guarantee him the title, Mansell would narrowly miss out on winning it after his left-rear tyre exploded in spectacular fashion on the main straight with only 19 laps of the race to go. 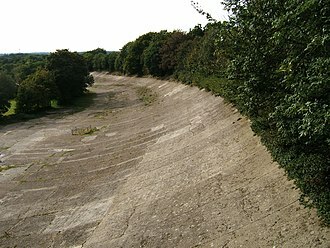 In a 2012 interview for Sky Sports Legends of F1 Mansell revealed that, had he hit the wall rather than wrestling the car safely to a halt in the run-off area at the end of the straight, the stewards would most likely have red flagged the race. 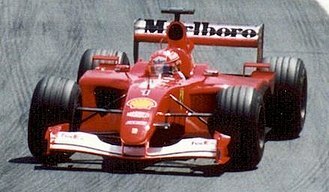 As the race was over two thirds distance, he would have kept his position and won his first F1 world title. Instead Mansell ended the season as runner-up to Alain Prost. His efforts in 1986 led to his being voted the BBC Sports Personality of the Year. 1986 proved to be a tough year for both Mansell and the Williams team, off the track at least. After a pre-season test session at the Paul Ricard Circuit in the south of France, team owner Frank Williams was involved in a horrific road accident which left him a tetraplegic. Williams would not return to the scene until making a surprise appearance at the British Grand Prix at Brands Hatch where Mansell and Piquet finished 1–2. Williams's absence from the day-to-day running of the team actually created tension between the team and engine supplier Honda. The Japanese giant regarded dual World Champion Nelson Piquet as the team's number one driver (they were reportedly paying the bulk of Piquet's multimillion-dollar retainer) and were reportedly unhappy that the team's co-owner and Technical Director Patrick Head did not rein in Mansell during races and allowed him to take both points and wins from Piquet. As it was, while Williams dominated the Constructors' Championship, the two drivers took enough points from each other to allow McLaren's Alain Prost to sneak through and win the Drivers' Championship. Before the season had started Honda had reportedly attempted to persuade Frank Williams to replace Mansell with their own test driver Satoru Nakajima. Williams, who was always more interested in the Constructors' title than the Drivers' as it showed that his team was the best, refused to do this, rightly believing that having two proven F1 winners in Piquet and Mansell would better-serve the team than Nakajima would as an F1 rookie. Six more wins followed in 1987, including an emotional and hugely popular victory at Silverstone for the British Grand Prix in which he came back from 28 seconds behind in 30 laps to beat teammate Piquet, with his car running out of fuel on the slowing down lap. 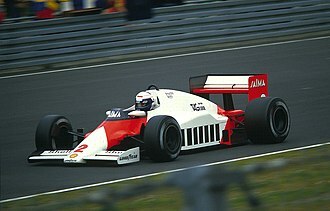 A serious qualifying accident at Suzuka in Japan for the penultimate race of the season severely injured Mansell's back (a spinal concussion). Trying to beat Piquet's lap time, Mansell made a mistake and hit the guardrail. As a result of Mansell's absence from the remaining two races, Piquet became champion for the third time. Piquet called his win over Mansell "a win of intelligence over stupidity". The Brazilian also added that he won because he was more consistent than his teammate, racking up points and podiums where Mansell often ran into trouble. Piquet's was a percentage driving policy which worked well in the ultra-competitive Williams-Honda, whereas Mansell was a hard charger who many felt often pushed his luck too far. In 1988, for the first time in his career, Mansell was a team's first driver, having won more races in the previous two seasons than any other driver. However Williams lost the turbo power of Honda to McLaren, and had to settle with a naturally aspirated Judd V8 engine in its first season in F1. A dismal season followed, which saw Mansell's Williams team experiment with a terribly unreliable (but extremely innovative) active suspension system (the system had worked well when introduced by the team in 1987 where it could draw on approximately 5% of the reported 1,000 bhp (746 kW; 1,014 PS) produced by the Honda turbo, but struggled with the 600 bhp (447 kW; 608 PS) Judd V8). Mansell would complete only two of the 14 races in which he appeared in 1988, both being podium finishes. One of these was a second place at the British Grand Prix at Silverstone where, overnight, the team had stopped using its active suspension (after months of Patrick Head telling Mansell and teammate Riccardo Patrese that it would take many months of work to do so), and reverted to a passive suspension set-up. Mansell contracted chickenpox in the summer of 1988 and after a competitive (but ill-advised) drive in the very hot conditions of the 1988 Hungarian Grand Prix the illness became worse, forcing him to miss the next two Grands Prix in Belgium where he was replaced by Martin Brundle, and Italy where he was infamously replaced by Frenchman Jean-Louis Schlesser. By missing the Italian Grand Prix at Monza, Mansell missed the traditional welcome by the Tifosi for a newly signed Ferrari driver after he had announced he would be leaving Williams to join the Maranello-based team for 1989. In preparation for the 1989 season, Mansell became the last Ferrari driver to be personally selected by Enzo Ferrari before his death in August 1988, an honour Mansell described as "one of the greatest in my entire career". Enzo Ferrari presented a 1989 Ferrari F40 as a gift to Mansell. 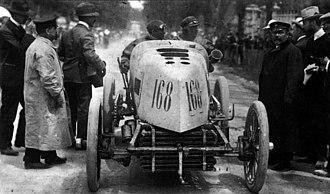 In Italy he became known as "il leone" ("the lion") by the tifosi because of his fearless driving style. The season was one of change in the sport, with the banning of turbo engines by the FIA and the introduction of the electronically controlled semi-automatic transmission by Ferrari. Mansell believed that 1989 would be a development year and that he would be able to challenge for the championship the following season. In his first appearance with the team he scored a very unlikely win in the 1989 Brazilian Grand Prix at the Autódromo Internacional Nelson Piquet in Rio de Janeiro; his least favourite track, and the home race of his bitter rival Piquet. He later joked that he had booked an early flight home for halfway through the race as he predicted the car's new electronic gearbox would last only a few laps (as it had done throughout pre-season testing and in qualifying for the race). Mansell became the first driver to win a race in a car with a semi-automatic gearbox. 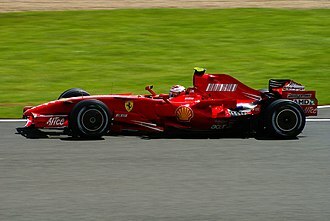 The race saw him as the first driver to win in their debut race for the Scuderia since Mario Andretti had won the 1971 South African Grand Prix and he would remain the last man to win on his Ferrari debut until Kimi Räikkönen won the 2007 Australian Grand Prix. The rest of 1989 was characterised by gearbox and various other problems, including a disqualification at the Canadian Grand Prix and a black-flagged incident at the Portuguese Grand Prix for reversing in the pit lane, which resulted in a ban for the next race in Spain. However, Mansell finished fourth in the Championship with the help of a memorable second win for Ferrari at the tight and twisty Hungaroring for the Hungarian Grand Prix. Early in practice Mansell had seen that trying to qualify the car high on the grid was a pointless exercise and he decided instead to concentrate on a good race set-up. After qualifying 12th (0.681s behind teammate Gerhard Berger in sixth and 2.225s behind pole man Riccardo Patrese in his Williams-Renault) and not even being considered a chance for the race, he charged his way through the field until he pulled off a sensational passing manoeuvre on the McLaren-Honda of World Champion Ayrton Senna on lap 58 to take a lead he would not lose. 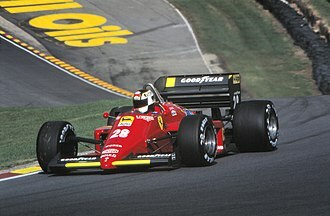 A tough 1990 followed with Ferrari, in which his car suffered more reliability problems, forcing him to retire from seven races. He was paired with Alain Prost, (who was also the reigning World Champion), and who took over as the team's lead driver. Mansell recalls one incident where at the 1990 British Grand Prix, the car he drove did not handle the same as in the previous race where he had taken pole position. On confronting the mechanics, it transpired that Prost saw Mansell as having a superior car and as a result, they were swapped without telling Mansell. After retiring from the race, he announced he was retiring from the sport altogether at the end of the season. This, combined with the fact that Frenchman Prost was not only a triple World Champion and the winner of more Grands Prix than anyone in history, but also spoke fluent Italian, whereas Mansell's Italian was only conversational at best, gave Prost greater influence within the Maranello-based team. According to Prost, Mansell only attended two or three mechanical briefings throughout the season, preferring playing golf. One notable highlight of the season was a daring pass on Gerhard Berger around the daunting high speed Peraltada corner that was later renamed in his honour. Approaching the corner for the penultimate time Mansell was bobbing from side to side in Berger's mirrors. Heading into one of the quickest corners on the calendar at the time, where the Ferraris had registered forces of 4.7g during practice, Mansell launched to the outside of Berger and flashed past to take second place. Mansell scored only a single win, at the 1990 Portuguese Grand Prix, and finished a thrilling second to Nelson Piquet in Australia, and finished fifth in the World Championship. His retirement plans were halted when Frank Williams again stepped in. Williams signed Mansell on 1 October 1990 after Mansell was assured the contract stated that he would be the focus of the team, having experienced being the 'Number Two' driver at Ferrari. Mansell would be paid £4.6 million a season, a deal which made him the highest paid British sportsman at the time. Mansell gives Ayrton Senna a lift after winning the 1991 British Grand Prix. Mansell's return to Williams was not straightforward. 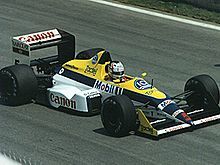 He would agree to return only if a list of demands were met, including undisputed number one status over Riccardo Patrese (who had remained with the team through 1989 and 1990), guarantees of support in a wide variety of areas with each guarantee in writing, and assurances from suppliers such as Renault and Elf that they would do everything necessary to help him win. Frank Williams said the demands were 'impossible'; Mansell concluded that if that were the case he would be happy to retire. Three weeks later the impossible had happened and Mansell was a Williams driver. His second stint with Williams was even better than the first. Back in the familiar 'Red 5', he won five races in 1991, most memorably in the Spanish Grand Prix. In this race he went wheel-to-wheel with Ayrton Senna, with only centimetres to spare, at over 320 km/h (199 mph) on the main straight. Quite a different spectacle was offered following Mansell's victory in the British Grand Prix at Silverstone. Senna's car had stopped on the final lap, but, rather than leave his rival stranded out on the circuit (the two had actually come to blows in the pits following their first lap tangle during the 1987 Belgian Grand Prix and were hardly close friends), Mansell pulled over on his victory lap and allowed Senna to ride on the Williams sidepod back to the pits. The Williams team's decision to develop their new semi-automatic gearbox by racing with it at the start of the season, was at the cost of points in the opening rounds of the championship. Senna was on 40 points with four straight wins to open the season by the time Mansell gained his first finish with a second in Monaco. Mansell then had the next race in Canada practically won when his Williams FW14 stopped half a lap from the finish with what was reported to be transmission failure, though it was suspected that Mansell had let his engine revs drop too low while he was waving to the crowd in celebration and stalled his engine. Ironically this handed Nelson Piquet his 23rd and last F1 race win. Despite a good mid-season, which included a hat-trick of victories, Senna's consistency (and Mansell's retirements at key races) meant that he finished second in the Championship for the third time in his career, this time behind Senna. 1992 would be Mansell's finest season. He started the year with five straight victories (a record not equalled until Michael Schumacher in 2004). At the sixth round of the season in Monaco, he took pole and dominated much of the race. However, with seven laps remaining, Mansell suffered a loose wheel nut and was forced into the pits, emerging behind Ayrton Senna's McLaren-Honda. Mansell, on fresh tyres, set a lap record almost two seconds quicker than Senna's and closed from 5.2 to 1.9 seconds in only two laps. The pair duelled around Monaco for the final four laps but Mansell could find no way past, finishing just 0.2 seconds behind the Brazilian. Mansell became the most successful British driver of all time when he won the British Grand Prix at Silverstone, as he surpassed Jackie Stewart's record of 27 wins with his 28th. Mansell was crowned Formula One World Champion early in the season at the Hungarian Grand Prix, the 11th round of that season, where his second-place finish clinched the Drivers' Championship, securing the title in the least number of Grands Prix since the 16-race season format started. Mansell also set the then-record for the most number of wins in one season (9); both records stood until broken by Schumacher in 2002. He managed 14 pole positions that year, a record only broken by Sebastian Vettel in 2011 in the Brazilian Grand Prix on 26 November. 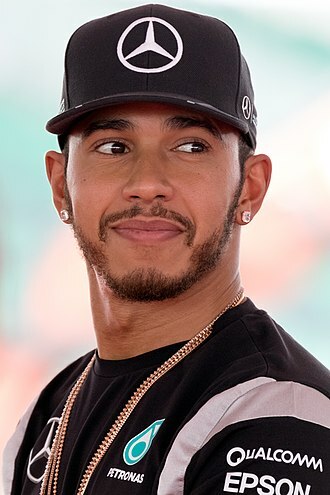 He also held the record for the most races before becoming World Champion with 180 races; this record was broken by Nico Rosberg in 2016 with 206 races. Other Formula One records set in 1992 that he still holds are the highest percentage of pole positions in a season (88%), most wins from pole position in a season (nine) and most runner-up championship finishes before becoming World Champion (three). Mansell also holds the record for obtaining pole position and scoring the fastest lap and subsequently retiring from the race (1987 German Grand Prix, 1990 British Grand Prix, 1992 Japanese Grand Prix, and 1992 Italian Grand Prix). He is the driver having the most wins (31) without ever winning Monaco. He won the BBC Sports Personality of the Year award again in 1992, one of only four people to have won the award twice. During this season, Mansell gained a reputation for a psychological competitiveness and mind games. After the announcement by the FIA that the organization would be weighing drivers, Mansell, known for ignoring diet, starved and dehydrated himself the day prior to weigh-ins. This measure led to Mansell weighing less than his teammate Riccardo Patrese by one and a half kilograms. Despite being world champion, Mansell had a public disagreement with Williams. In his autobiography Mansell writes that this was because of a deal made at the previous Hungarian Grand Prix, which Williams reneged on, and the prospect of his former teammate Alain Prost, who had sat out the 1992 season, joining the Renault-powered team. Williams had neglected to tell Mansell that Prost had signed for 1993 at only the second race of the 1992 season in Mexico, a position that Mansell felt would be similar to their days together at Ferrari. To boot, Ayrton Senna had expressed a strong desire to drive for Williams and even offered to drive for them at no salary (only to later be rebuffed as Prost, whose rivalry with the Brazilian was just as intense as the one he had with Mansell, had a clause written into his contract which enabled him to block Senna's effort). Williams decided that there was little sense in paying the high fees Mansell went on to demand. With the original offer revoked, and with the premiere teams already committed to their incumbent drivers, Mansell decided to move on. An 11th hour offer was made to him at the Italian Grand Prix, but by then the damage was done; Mansell retired from F1. Mansell then signed with Newman/Haas Racing to pair with Mario Andretti in the CART series, replacing Mario's son Michael who moved to F1 and McLaren. At the season opener at Surfers Paradise, Australia, he became the first "rookie" to take pole position and win his first race. A few weeks later however, he suffered a substantial crash at the Phoenix International Raceway, severely injuring his back. At the 1993 Indianapolis 500, Mansell would lead the race only to finish third after losing the lead to Emerson Fittipaldi and Arie Luyendyk after a poor restart. On his 40th birthday, however, Mansell would avenge his loss at Indianapolis to score a 500-mile race victory at Michigan, considered by many a tougher 500 mile race to win. He would go on to score five wins for the 1993 CART season, which, with more high-placed finishes, was good enough to earn him the championship. This enabled Mansell to become the only driver in history to hold both the Formula One and CART championships at the same time, because when he won the 1993 CART championship he was still the reigning F1 world champion, with the 1993 F1 championship not yet having been decided. Following this successful season in CART, Mansell received several awards, including a Gold Medal from the Royal Automobile Club and the 1994 ESPY Award for Best Driver. His Newman/Haas car was much less reliable the following year, 1994, and results suffered. It was during this season that Mansell "wore out his welcome" in the United States with glimpses of rude behaviour, particularly after he was knocked out of the Indianapolis 500. After the crash, he stormed out of the track hospital, and refused medical care. When reporter Dr. Jerry Punch asked Mansell if he had spoken with Dennis Vitolo, the driver who had crashed into him, Mansell replied, "You speak to him" and shoved the camera away. Subsequently, Mansell was due to sign autographs at a K-mart store (the primary sponsor of his car), but because of a lack of demand the event was cancelled. Mansell was also the catalyst for the breakdown in the relationship between himself and Mario Andretti. Mario has since remarked "I guess if Ronnie Peterson was the best team-mate I ever had, Nigel Mansell was the worst" and "I had a lot of respect for him as a driver, but not as a man". In 1994, after the CART season ended, Mansell returned to F1 and re-joined the Williams team. Since he had left it in 1993, the team had undergone some significant changes. 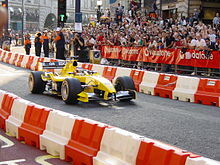 Damon Hill had been promoted from test driver and was running full-time in one Renault. Prost, Mansell's replacement, won the 1993 Drivers' Championship and then retired after the season. This allowed Williams and Ayrton Senna to finally work out an agreement, and the team received a new sponsor in Rothmans International for a season in which they were expected to remain as champions. However, the car proved unreliable and tricky to handle early in the season, leading Senna to retire from the opening rounds despite claiming pole. In the third race at Imola tragedy struck as Senna was killed in a crash on the Tamburello curve. Mansell took over the car Senna was brought in to drive toward the end of the 1994 campaign after a one-off appearance at the French Grand Prix that year. Mansell was paid approximately £900,000 per race, compared to his teammate Hill being paid £300,000 for the entire season. Mansell's return was helped by Bernie Ecclestone helping unravel his contracts in the United States. It was important for F1 to have a world champion driving that season and with worldwide TV viewing figures starting to decline, they needed Mansell. The 40-year-old was not as quick as Damon Hill in race trim but signs that his speeds were coming back were evident in Japan during a fantastic battle with the Ferrari of Jean Alesi. Mansell took his final Grand Prix victory in Adelaide, the last race of the season, having out-qualified the two title contenders at the time, Damon Hill and Michael Schumacher, in the process (helped out by the second qualifying session being held on a wet track, with the times from the first session making up the grid). The plan initially was for Mansell to protect Hill from Schumacher, but both drivers passed him at the start and eventually collided (causing the retirement of both), handing Schumacher his first world title. Williams had an option on Mansell's services for 1995 which Mansell was convinced they would take. Williams however, opted for youth over experience and hired David Coulthard. After losing the Williams seat to David Coulthard, Mansell signed to drive for McLaren in 1995. McLaren's title sponsors Marlboro wanted a world champion, whereas McLaren and their engine suppliers Mercedes wanted a lower-profile driver for what was their first official year back in Formula One since 1955. Before the season started, Mansell could not fit into the narrow car and was deputised by Mark Blundell for the opening two rounds in Brazil and Argentina. Mansell's car was completed in 33 days and in time for Imola, where despite being in the top six late in the race, a clash with Eddie Irvine saw him finish 10th and out of the points. The Spanish Grand Prix saw Mansell become frustrated over his car's handling characteristics, he chose to retire after just two races with the team. Mansell cited the decision to retire as his not wanting to make up the numbers and with no hope of the McLaren MP4/10 being competitive. In 2015, Mansell stated that he was wrong to leave McLaren so soon and that in hindsight he should have continued with the team for the season and help improve the car. A few testing sessions with F1 teams including Jordan suggested another comeback could be on the cards, but it never happened. 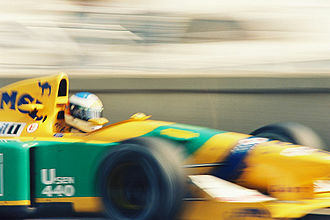 Reports at the time suggested that the Mansell–Jordan partnership for 1997 was a real possibility with Eddie Jordan's title sponsor willing to pay for the deal. Mansell competing at Brands Hatch in the BTCC. Mansell took part in the 1993 TOCA Shootout, held at Donington Park. Mansell drove a Ford Mondeo with his usual red number 5. The race ended in disaster for Mansell; he was knocked unconscious following a crash with six laps remaining. He lost control of his car through the exit of the Old Hairpin, over-corrected the slide and collided with Tiff Needell's Vauxhall Cavalier, resulting in a spin and a bad crash into the tyre wall under the bridge. Mansell made a return to racing in 1998 in the British Touring Car Championship, driving in a Ford Mondeo for three rounds. With the number 5 already taken by James Thompson, Mansell raced with the red number 55. At his first event at Donington Park, he retired three laps into the sprint race, meaning he would start the feature race in 19th position on the grid. As the conditions changed and the track became wetter, Mansell found himself leading the race for several laps, and he finished in fifth position. 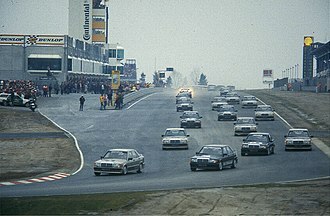 The race was regarded by many fans as one of the greatest in touring car history. It was to be his best finish in the series, as he failed to finish either race at the next round he participated in at Brands Hatch, and at his final race at Silverstone he finished in 14th and 11th place. Having competed in three of the 13 rounds, he finished 18th out of 21 in the Drivers' Championship. On 16 July 2005, Mansell took part in a Race of Legends exhibition event at the Norisring round of the DTM. He competed against other Formula One World Champions Jody Scheckter, Alain Prost and Emerson Fittipaldi, as well as Motorcycle Grand Prix World Champions Mick Doohan and Johnny Cecotto (himself a former F1 driver), each driver having an opportunity to drive Audi, Mercedes and Opel cars. Prost was announced as the winner by the DTM organisers. Mansell became a financial stakeholder and a driver in the new Grand Prix Masters series. Following a period of testing and developing the car, Mansell made a successful race comeback by winning the inaugural race of the series in Kyalami in November 2005 (Mansell had won at the old Kyalami circuit in 1985 and had also won at the new circuit in 1992). After the success of the race at Kyalami, four dates were scheduled for the GP Masters Series in 2006, including one at Silverstone. Mansell won the season opener at Qatar in April from pole position. The Monza round of the series was cancelled due to noise limitations at the venue, whilst technical issues quickly ruled him out of the Silverstone race. Also in 2006 he appeared at Brands Hatch, scene of his first Grand Prix win, in October 1985, driving some demonstration laps in the BMW M3 GTR that Andy Priaulx drove to victory in the 2005 24 Hours Nürburgring, as part of the World Touring Car Championship event. On the weekend of 6 May 2007 he made an appearance in the second round of the FIA GT Championship at Silverstone driving a Ferrari 430 GT2 for the Scuderia Ecosse team. He was paired with Chris Niarchos, finishing seventh in class and 21st overall. Mansell, with his son Leo, tested a Chamberlain-Synergy team Le Mans prototype Lola-AER B06/10 during the week commencing 14 July 2008, at the Estoril circuit. 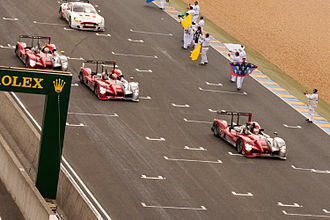 The pair were said to be considering a drive in the American Le Mans series, possibly commencing as soon as October 2008 in the Petit Le Mans event, although neither driver was in the final field. On 3 July 2009, Mansell tested his other son Greg's World Series by Renault car at the Silverstone Circuit, setting a best time six seconds off the pace of the fastest driver in the session. Mansell took part in the last round of the 2009 Le Mans Series, the 1000 km of Silverstone, driving Team LNT's Ginetta-Zytek GZ09S alongside his son Greg and team boss Lawrence Tomlinson. Mansell raced a Ginetta-Zytek GZ09S in the 2010 24 Hours of Le Mans, alongside his two sons. According to the BBC, this was the first time a father has raced at Le Mans in the same car as his two sons. However, in the race he crashed going 240 mph after only five laps, following a tire puncture. Reports at the time indicated that he had suffered a concussion, but Mansell later revealed that the accident left him unable to talk or recognize his wife and children. To recover, he took up magic in order to “get [his] brain to work in different ways.” Since taking up the hobby, Mansell has become a member of the Magic Circle and gone on to perform around the world. 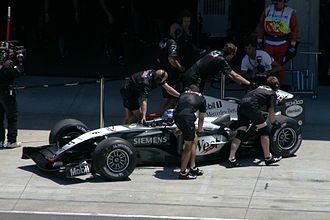 For the 2010 Formula One season, the Sporting Regulations were changed so that a former driver sits on the stewards' panel. Mansell took this role at the 2010, 2011 and 2012 British Grands Prix. On 1 October 2009 Nigel appeared as the 'Face of Euronics'. In 2010, Nigel paired with Iranian-British comic Omid Djalili in a UK television advertising campaign for price comparison website Moneysupermarket.com and at the end of the first ad, Djalili put a fake moustache on Mansell's upper lip. There were three video games endorsed by Mansell: Nigel Mansell's Grand Prix (1988, Martech), Nigel Mansell's World Championship (1993, Gremlin Graphics), and Newman/Haas IndyCar (1994). Mansell also appeared as a playable driver for Williams in Codemasters' F1 2013. Mansell has been married to Roseanne since 1975 after meeting as students. He lived in Port Erin on the Isle of Man during most of his F1 career until 1995. Mansell currently lives in Jersey, Channel Islands. He spent 11 years of his life as a Special Constable on the Isle of Man during his driving career, and in Devon after he retired from racing. During this period, he also developed a golf course in Devon. A keen golfer, Mansell revealed a desire to compete in the British Open Golf Championship and briefly participated in the 1988 Australian Open. Mansell is the owner of the Team UK Youth cycling team. Mansell appeared without his well-known moustache in the first half of the 1988 season. After his official retirement from Formula One in 1995, he shaved it off. 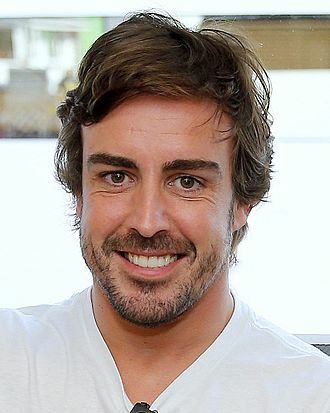 The moustache made a re-appearance when Mansell was interviewed by the BBC at the 2014 Japanese Grand Prix. His sons Leo and Greg are also racing drivers, while his daughter Chloe is a designer. Mansell raced with a blue helmet with two red and white arrows on each side forming on the front a drawing resembling the Union Flag with the upper angles of the arrows united by a red and white 'U' with the white chin area, when he entered Williams, a blue ring was added on the white part of the helmet. His sons Leo and Greg inherited his helmet design, but Leo's helmet has the red chin area and the white part that envelops the visor (not counting the top) is red with white outline, while Greg's helmet has the blue chin area and the white area that envelopes the visor is blue with white outline. 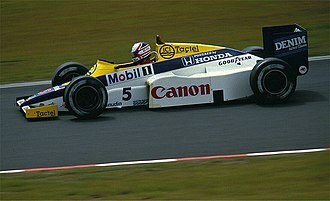 Although teams in motor racing series are generally allocated numbers, Mansell has been associated with the number 5 for many years. This began when he joined Williams in 1985 and was allocated car number 5, as at the time Formula One racing numbers were allocated by constructor and Williams received numbers 5 and 6. For the first four races of the 1985 season, both Williams cars had white numbers, but from a distance the numerals "5" and "6" resembled each other. As a consequence, it was decided to give Mansell's car a red number to make it more distinctive. While this was initially just for recognition, BBC F1 commentator Murray Walker began describing Mansell's car as "Red Five", leading to Mansell retaining the red coloured number throughout his first spell at Williams. 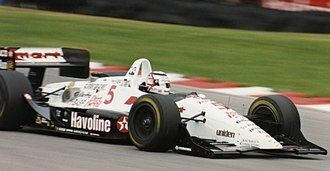 On his return to the team in 1991, Williams had retained the number 5 car, allowing Mansell to race as "Red Five" once again. After his departure to Indy Car Racing in 1993 to drive for Newman/Haas, he again retained the red number 5: then as now in American racing, drivers are free to choose their own racing number, a practice adopted by F1 in 2014. 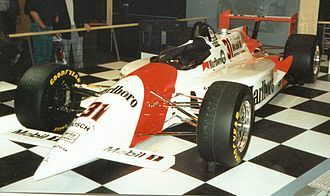 In addition, "Red Five" fit well into the livery of his Indy car, as Newman Haas's main sponsors Texaco and Kmart both shared corporate colors of black, white and red. When he returned to Williams for four races in 1994 the team's numbers were 0 and 2 as they had won the Drivers' and Constructors' titles in 1993 but would not run #1 as Alain Prost had retired. Damon Hill drove car #0 while Mansell raced the #2 with the number on the nose of the car painted red. So associated with the red 5 is Mansell that, in 2004, he purchased a yacht from Sunseeker, one of his longtime sponsors, which he named Red 5. Mansell was awarded the title of BBC Sports Personality of the Year in both 1986 and 1992. Only three other people have won the award twice, one of whom being fellow racing driver and former F1 World Champion Damon Hill. Mansell was inducted into the International Motorsports Hall of Fame in 2005. Mansell won the Hawthorn Memorial Trophy, an award for the leading British or Commonwealth driver in F1 each year, a record seven times in his career. Already Officer of the Order of the British Empire (OBE), Mansell was appointed Commander of the Order of the British Empire (CBE) in the 2012 New Year Honours for services to children and young people (as president of UK Youth). In 2015 turn 17 of the Autodromo Hermanos Rodríguez was renamed in honour of Mansell, twice winner of the Mexican Grand Prix (1987 and 1992). He received The London Classic Car Show Icon Award in 2018. ^ "Lewis Hamilton happy to 'outsmart' Nico Rosberg at United States GP". BBC Sport. Retrieved 3 November 2014. ^ Eason, Kevin (27 March 2009). "The 50 greatest Formula One drivers Nos 101". The Times. London. Retrieved 20 May 2010. ^ Who We Are | Our Supporters Archived 12 December 2009 at the Wayback Machine. UK Youth (13 November 2010). 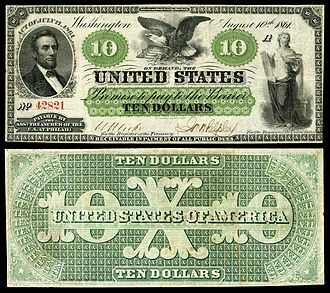 Retrieved on 11 June 2011. ^ "About". BRSCC. Retrieved 27 July 2018. ^ "F1 legend Nigel Mansell to open new Mitsubishi dealership". Car Dealer magazine. Retrieved 9 September 2014. ^ a b Jitchotvisut, Janaki (3 January 2012). "25 Racers Who Overcame Gnarly Injuries". Complex. Retrieved 27 February 2018. ^ a b King Nigel Mansell Statistics Archived 15 June 2006 at the Wayback Machine. Nigelmansell.free.fr. Retrieved on 11 June 2011. ^ "Mansell lads have driving ambition". OxfordTimes. 20 February 2006. Retrieved 27 February 2018. 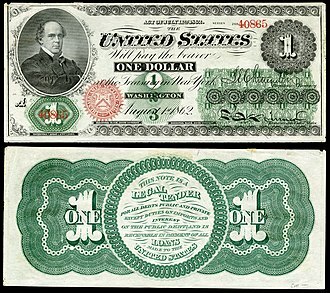 ^ a b Cotton, Michael (13 May 2013). "David Price, Thirty Years Without Getting Bored!". DailySportsCar. Retrieved 27 February 2018. ^ Mansell, Nigel (1996). Nigel Mansell: My Autobiography. Harper Collins. ISBN 0002187035. ^ United States GP, 1984. grandprix.com. Retrieved on 11 June 2011. ^ Roebuck, Nigel. "Mansell interview: A champion in waiting". Autosport. Retrieved 27 February 2018. ^ "F1 driver rivalries ranked: Where do Hamilton and Rosberg figure in the most intense battles in history?". The Telegraph. 23 November 2016. Retrieved 27 February 2018. ^ "Mansell's title hopes explode". The Guardian. October 1986. Retrieved 19 March 2012. ^ Mansell, Nigel (18 March 2012). "Legends of F1". Sky Sports. ^ "Fans drive Mansell to British victory". The Milwaukee Journal. 13 July 1987. p. 2C. ^ "Nigel Mansell | Joe-Pinions: Sports". txtmstrjoeonsports.wordpress.com. Retrieved 2018-07-18. ^ "Mansell vs Piquet". YouTube. 20 September 1987. Retrieved 26 February 2013. ^ Benson, Andrew (7 October 2009). "Pick your classic Brazilian Grand Prix". BBC. Retrieved 27 February 2018. ^ "Prost wins from 13th, Mansell stuns Berger – and Senna hits 100". f1fanatic.co.uk. Retrieved 24 June 2015. ^ Mansell, Nigel (1996). My Autobiography. Collins Willow. p. 263. ISBN 0-00-218703-5. ^ Newey, Adrian (9 November 2017). "How ketchup and mind games made Nigel Mansell a world champion". The Telegraph. Retrieved 27 February 2018. ^ "Mario: Nige my worst team-mate". ITv-F1. Archived from the original on 29 September 2007. Retrieved 23 August 2006. ^ "McLaren confirms Mansell". grandprix.com. 6 February 1995. Retrieved 12 June 2014. ^ Allsop, Derick (24 May 1995). "Mansell faces retirement after McLaren exit". The Independent. Retrieved 12 June 2014. ^ "Jenson Button can win again at McLaren-Honda- Nigel Mansell". BBC. 1 October 2015. Retrieved 12 September 2017. ^ a b "Mansell and Jordan". grandprix.com. 9 December 1996. Retrieved 9 August 2014. ^ "Mansell Released From Hospital". The New York Times. 2 November 1993. ^ James Thompson – Honda Accord 1998. Redshoes Archive (26 April 1998). Retrieved on 11 June 2011. ^ Nigel Mansell – Ford Mondeo 1998. Redshoes Archive (20 September 1998). Retrieved on 11 June 2011. ^ Donington Park 14 June 1998. BTCC Pages. Retrieved on 11 June 2011. ^ Reid 150 Not Out Archived 30 September 2007 at the Wayback Machine. Crash.net (1 January 1980). Retrieved on 11 June 2011. ^ Brands Hatch 31 August 1998. BTCC Pages. Retrieved on 11 June 2011. ^ Silverstone 20 September 1998. BTCC Pages. Retrieved on 11 June 2011. ^ BTCC 1998 Season. Btccpages.com. Retrieved on 11 June 2011. ^ "The € 500,000 Euro Race – World Champions in DTM Cars". DTM.de. Retrieved 22 December 2006. ^ "Prost wins the €500,000 charity race". DTM.de. Retrieved 22 December 2006. . Note: In-depth information on times set by each driver do not appear to have been formally published by the organisers. ^ Mansell secures GP Masters glory. BBC News (13 November 2005). Retrieved on 11 June 2011. ^ "Nigel Mansell to race for Scuderia Ecosse at Silverstone". FIAGT.com. Archived from the original on 29 May 2007. Retrieved 14 April 2007. ^ English, Steven (17 July 2008). "Mansell tests ALMS Lola with son Leo". autosport.com. Retrieved 18 July 2008. ^ English, Steven (24 July 2008). "Mansells plan Petit Le Mans outing". autosport.com. Retrieved 30 August 2008. ^ Mills, Peter (3 July 2009). "Nigel Mansell tests Renault 3.5 car". autosport.com. Haymarket. Retrieved 3 July 2009. ^ "Mansell enters AUTOSPORT 1000km". Autosport. 19 August 2009. ^ "Nigel Mansell set to race with sons at Le Mans 24-Hours". news.bbc.co.uk. 4 February 2010. Retrieved 15 March 2010. ^ "Mansell suffers crash at Le Mans". BBC News. 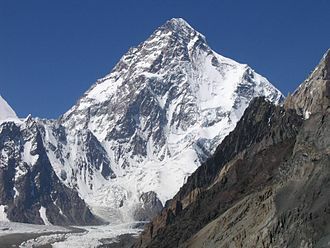 12 June 2010. ^ Dunn, James (31 July 2016). "'It's as exciting as racing a car': Formula 1 legend Nigel Mansell reveals how learning MAGIC helped him recover from horrific 240mph Le Mans crash". DailyMail. Retrieved 27 February 2018. ^ "Mansell face of Euronics". www.euronics.co.uk. 1 October 2000. Retrieved 10 October 2009. ^ BBC SPORT | Motorsport | Formula One | Mansell makes Isle of Man return. BBC News (20 December 2007). Retrieved on 11 June 2011. ^ "Former racing champion banned from the road". BBC News. 23 January 1998. Retrieved 28 October 2009. ^ Young, Colin (17 July 1986). "Mansell has another driving ambition". The Sydney Morning Herald. 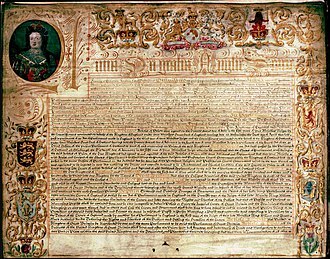 p. 39. ^ Pye, Steven (16 December 2013). "Heard the one about Nigel Mansell playing golf in the Australian Open?". The Guardian (Guardian Media Group). Retrieved 8 April 2014. ^ "Nigel Mansell – Team Owner". Team UK Youth. Archived from the original on 5 May 2013. Retrieved 20 April 2013. ^ Schot, Marcel (2002). "The F1 FAQ". Atlas F1. 8 (39). 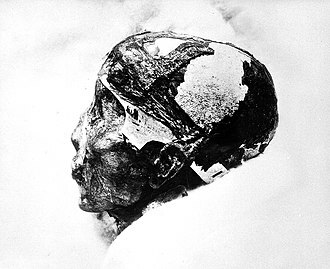 Retrieved 30 January 2013. ^ "Life After Racing". nigelmansell.co.uk. Archived from the original on 16 June 2013. Retrieved 30 January 2013. ^ 1986 bbc.co.uk: BBC Sports Personalility of the year. BBC News. Retrieved on 11 June 2011. ^ 1992 bbc.co.uk: BBC Sports Personality of the year. BBC News. Retrieved on 11 June 2011. ^ Waltrip Heads Class of 2005 at Motorsports Hall of Fame. Motorsportshalloffame.com. Retrieved on 11 June 2011. ^ "No. 60009". The London Gazette (Supplement). 31 December 2011. p. 7. ^ "The London Classic Car Show Icon Award". The London Classic Car Show. Retrieved 20 February 2018. ^ "All Results of Nigel Mansell". racingsportscars.com. Retrieved June 14, 2018. Wikimedia Commons has media related to Nigel Mansell. Grand Prix Masters was a one-make motor racing series featuring retired Formula One drivers. The inaugural event, at the Kyalami Grand Prix Circuit in South Africa, took place on 11–13 November, Grand Prix Masters was modeled on the lucrative seniors tours of golf and tennis. All participants race identical open wheel cars, which are based on the 2000 Reynard 2KI Champ Car, the chassis was built by English constructor Delta Motorsport, and was powered by a naturally aspirated,3. 5-litre, 80-degree V8 engine produced by Nicholson McLaren. In 2007 cars were to have been powered by a Mecachrome 90-degree V84.0 litre and it developed 600 bhp and revved to in excess of 9500 rpm. Gearbox operation is fully manual, and controlled by a paddle shift arrangement. 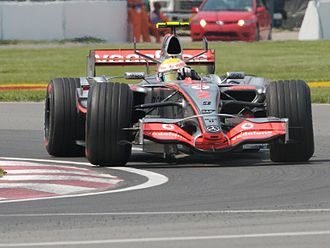 Grand Prix Masters promoters boasted that the 650 kg cars reach 200 mph, the Grand Prix Masters car first ran in late-September 2005 in the hands of Delta Motorsport Operations Director Simon Dowson. He reported a successful shakedown, despite appearing to sit high in the car. In mid-October 2005, Nigel Mansell and René Arnoux tested the car at the Pembrey Circuit in South Wales, de Cesaris was fastest, Danner slowest whilst Tambay crashed. There were questions surrounding the fitness of the former Formula One stars who ended up competing in the series, Jones hit back claiming the only time Danner had seen a Grand Prix podium was when he passed it on the way to the lavatory. Jones lack of fitness at the first GP Masters event might suggest Danners assessment had some merit, the first event took place at Kyalami in South Africa on 13 November 2005. Nigel Mansell took pole won after battling hard with Emerson Fittipaldi, andrea de Cesaris finished fourth after a storming drive, where he pushed past Derek Warwick. Stefan Johansson spun out early on, jacques Laffite retired with damaged right-front suspension after colliding with René Arnoux. As predicted, Alan Jones proved a disappointment, in practice he was up to ten seconds off the pace of Mansell, before pulling out of the race –- ostensibly due to neck injury. Nico Rosberg took pole position for Mercedes. Sebastian Vettel suffered a puncture at the start and later retired after a crash. 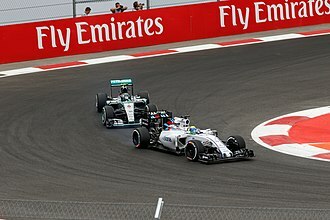 Nico Rosberg (seen here behind Felipe Massa) won the race.